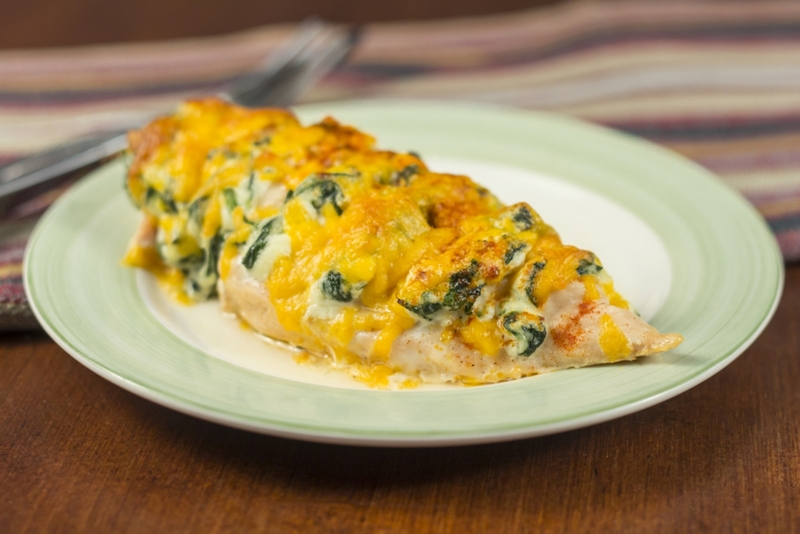 You’ve Had Stuffed Chicken, But Not Like This! “Hasselback potatoes have long been a favorite of ours, as we love the way the flavors seep all the way through the potatoes, adding extra deliciousness to every bite. For those of you who haven’t tried them, Hasselback potatoes are when you make a series of cuts into the potato, without cutting all the way to the bottom. Then, you stuff said slits with anything you want! Cheese, bacon, chives, etc…you really can’t go wrong. Preheat your oven to 350º F, and grease a large baking sheet. Heat olive oil in a large pan or skillet over medium-high heat. Add spinach to pan and cook, stirring continuously until spinach is wilted. Remove pan from heat. Stir ricotta and Cajun seasoning into the wilted spinach. Place chicken breasts on greased baking sheet. Use a sharp knife to slice several vertical slits about three-quarters of the way through each chicken breast. Make the slits about 1/2 inch apart. Stuff the slits with spinach ricotta mixture. Season chicken generously with salt and pepper, then sprinkle shredded cheddar evenly over them. Place baking sheet in oven and bake for 25 minutes. Finish the chicken by browning the cheese underneath a hot broiler for 3-5 minutes. Remove from oven, serve hot and enjoy!